Recently selected by The US Green Building Council as the 2014 LEED Outstanding Multifamily Project of the year. This is a national award. 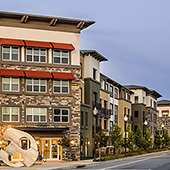 888 San Mateo has been an environmentally thoughtful community right from the start. We began with a smart infill location and an efficient architectural design to minimize material waste during construction, while also utilizing on-site recycling to further divert debris from overcrowded landfills. 888 San Mateo was built with a selection of sustainable construction materials designed to limit the consumption of natural resources including gas, electricity, and water during and after construction. These factors, in addition to many other environmentally mindful measures established at 888 San Mateo contributed to our community receiving the prestigious level of Platinum certification for LEED® for homes in 2014. 550,000 s.f. Office Campus Development. LEED Gold rating achieved. Water conservation of more than 30% within the building using water-efficient fixtures and more than 50% using water-efficient landscaping. Optimized energy performance by designing systems to over 20% below Title 24 standards and performing commissioning on all electrical and mechanical systems. Greatly enhanced indoor environmental quality through the installation of an under-floor air system, which increases ventilation effectiveness and user control, and through the use of low-emitting paints, carpets, composite wood, adhesives and sealers. The project also reduced the use of materials and resources by diverting greater than 75% of construction waste from landfills and choosing to acquire over 40% of our building materials from local manufacturers. The heat island effect is reduced with the use of Sarnafil PVC white roofing, which has a cleaner and healthier installation process, as well as a high solar reflectance index (SRI). Stormwater runoff was addressed by installing a 72″ stormwater system to reduce natural flows in the stormwater system during rain events. 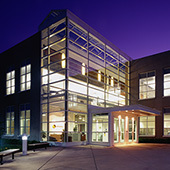 LEED Silver Certification. 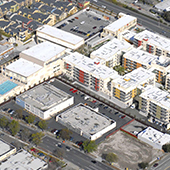 Mixed-use Community Center and Senior Independent and Assisted Living Facility. This project is a classic example of brownfield redevelopment and reparation of urban blight. Beyond improving the sustainability of the site, energy performance has been optimized by using high-efficiency heat pumps and occupancy sensors for interior lighting. The landscaping design has prioritized water efficiency, and double-flush toilets have been adopted to further reduce water usage. Phased 400,000 s.f. Call Center. 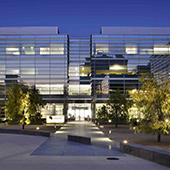 Symantec reduced its lighting energy costs 50% by incorporating a 744-foot long continuous skylight and using reflectors that let one bulb do the work of three. The buildings have day light sensors throughout. The project included all engineered wood products and bamboo flooring. In Phase II, a grove of Douglas firs was retained, and an extensive groundwater recharge system was installed to capture stormwater. Phase II 326,000 s.f. Campus Expansion of a 1,000,000 s.f. Master Planned Office Campus. 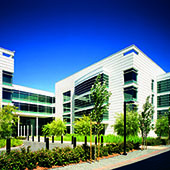 The four-story office building has energy-efficient exterior glazing, an energy-efficient raised-floor mechanical system and recycled flooring materials. The Phase II building is 25% more energy efficient than the Phase I buildings. 136,000 s.f. 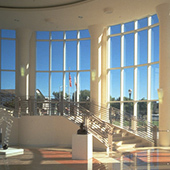 Turn Key City Hall. Consideration was given to green building practices in the use of recycled materials and efficient mechanical and electrical systems.